Own A Unique Commercial Ceiling Cleaning & Specialty Service Business For Less Than $500. Training & Equipment Included! I actually spent much more on a ceiling cleaning business in 1990. I can teach you to do what they do and more, with less work, fewer problems, at higher profit margins, and with a much better level of customer satisfaction. If you decide to move forward in this specialty ceiling cleaning business, you will own a unique commercial cleaning business that earns $180 – $300 an hour with over 90% profit for less than $500. I’ve been profiting nicely from this unique and specialized commercial ceiling cleaning business for several years now, and I’m willing to teach you how you can do the same. The payment below reflects earnings for servicing 5 Wendy’s locations. I spent about 3 hours at each location. This is NOT a traditional ceiling cleaning business or a janitorial business. This is a proven overhead commercial cleaning business with proprietary techniques and specialty cleaning services I have developed over almost 3 decades in the field. I’ll teach you how to earn $100,000 annually working only 10 – 15 hours a week in a unique ceiling cleaning business. Nothing has been left to chance. You’ll learn in great detail in easy to follow training manuals how to market your services to land the jobs and how to perform the work. You need no sales ability or special skills. You don’t need employees. Anyone can do this. One person can do what I do and profit similarly. This is the perfect low cost startup business for an entrepreneur looking to make high profits, a currently employed person looking to make an outstanding income in their spare time, or for an existing commercial service business looking to add revenue streams. The Training Manuals cover sales and operations in detail. You’ll receive over 350 pages of easy to follow training material outlining how to do what I do and profit in your area as I do in mine. This also includes several proven sales and marketing pieces, flyers, mail outs, and letters of introduction that I’ve used year after year to get new business. NOT a franchise either … or similar commercial business that you may have researched in the process of finding my page. There is no need to spend thousands of dollars to purchase the typical ceiling cleaning business, or other commercial cleaning business. You can earn as much or more for less work doing things the way I do. Don’t fall for their hype as I did. I will teach you how to serve the same customers for a small fraction of what these franchise and business opportunity sellers are asking … and how to make more money in less time with far less headaches. I paid $50,000 to buy into a commercial ceiling cleaning franchise and did it their way for several years. I took that experience and found a better way to solve the same problems for the same customers. I’m offering you a simple, 90% net profit business business that can earn you a full time income working only part time hours. It’s the perfect compliment to your full time job, add on to an existing commercial service business, or for those looking to start a unique and profitable business that earns up to $300 an hour or more. This is a new business opportunity you won’t find advertised in any business opportunity or franchise magazine. A business that I’m willing to share with a few of you in each state or province who would like to profit in their commercial communities as I have in mine. I need you to follow up and profit from any leads that come into my website from areas outside of my own. I’ll teach you how to earn $500 – 1000.00 / day in your spare time with proprietary methods and techniques I have developed over 28 years. Methods and techniques that are easy for you to duplicate. My Training Manuals are easy to read and understand, and written with you in mind. These manuals contain over 350 pages blueprinting how you can profit as I do. You can make an outstanding annual income in your spare time in a unique ceiling cleaning business for a total cost of less than $500. This includes all training material and equipment. There is nothing further to purchase. I’ll take the fear out of your interaction with prospects by training you to do so as a consultant rather than a salesperson. My Training Manuals will teach you exactly how to do what I do and profit in your area as I have in mine. Nothing has been left to chance. There is nothing further to purchase from me. I’ll also teach you how to perform add on services to generate extra revenue at every job site. The Training Manuals will provide you with over 350 sheet protected pages of easy to read, and easy to follow instruction in the hard copy version. OR, you can save significantly by purchasing the same Training Manuals in e-book PDF form and sent over immediately via email. Whichever you choose, by following my directions and duplicating what I do you can generate an outstanding income working only a few extra hours a day or on weekends. My information kit describes this business in greater detail and discusses the comparison between my methods and the methods of high profile franchises and other similar opportunities in the commercial cleaning business field. The companies that will ask you to part with thousands of dollars in exchange for a promise to earn a substantial income. Having never met me, I don’t expect you to take my word for it. Email me, or call for the free information kit. It contains 40 pages outlining what I do and how you can profit similarly. I paid $50,000 for a commercial ceiling cleaning business from the industry leader in 1989. I spent over 10 years doing things their way. Over that time, I discovered that the process they taught me, and the business model they wanted me to follow was flawed. Worst of all it was misleading. I found new ways to serve the same clientele more effectively, more efficiently, and with a much higher level of customer satisfaction. I made more money in less time, and enjoyed doing the work for the first time in 10 years. So I broke away from that franchise system and started doing things my way. The change in my business and peace of mind was remarkable. A few years ago, after millions of square feet serviced, perfecting my techniques, discovering proprietary ways to do things, and learning some tricks along the way, I decided to put all of my experience into 2 Training Manuals covering Operations, Customer Service, and the Sales & Marketing end of the business. Over the next couple of years I compiled over 350 pages of easy to read, step by step instruction on how to find the work, quote it, secure the jobs, and perform the services. You’ll learn about growing your business and much more. You’ll become an expert in customer service, and a valued service provider in your business community. My training information comes in two premium binders of sheet protected information written with clarity and your success in mind. You might be worried about risking your money with a business opportunity you found online. I understand how skeptical you may be. There are thousands of so called legitimate business opportunities to be found on the internet. This is one service business that is for real. I feel comfortable with that because I have created an easy to duplicate blueprint to your success. Most importantly, and unlike franchise and other business opportunities, you need absolutely zero sales experience or special social skills to find jobs in this commercial cleaning business. I have put together a proven method for you to get the jobs and pay for this business quickly. I don’t believe there is any business out there that can earn you so much for so little, and offer such a quick, and risk free return on your investment. Others who have purchased my program have said the same. You can make as much money as you want in this business if you are motivated to do so and put forth the effort to make it happen as per my instructions. It’s very likely that you will recover the cost of this Training Program on your very first job. I encourage you to research other franchises & opportunities costing up to $200,000 for such an immediate return on such a low initial investment. As a result, I am now offering the Training Manuals alone, along with a list of the exact equipment contained in the complete business package. This way you can visit local suppliers (I tell you where to find the equipment) which will save you a significant amount of money as well as shipping cost. As mentioned, you may already have some of this equipment at home. If not, all of the equipment necessary to get started can be found in your area for a few hundred dollars. All of it can fit in a small car. As an added bonus, the Training Manuals come with a protected territory, whereby no business package will be sold to anyone within a roughly 50 mile radius (negotiable) of your home base, and dependent upon population, marketing characteristics, and business demographics, to ensure you have the best chance to succeed. Cost for the two Training Manuals (Sales & Marketing, Operations) with a Protected Territory to operate from is $499.00 US plus shipping. You will receive 2 sturdy binders with over 350 sheet protected pages that will teach you exactly how to profit as I do. The Training Manuals also come with Bonus Reports (see below) describing how to make money from other related and specialty services I provide to the same customers. The Training Manuals also include a hard copy, and CD in Word Format collection of my own actual quotes & invoices for you to model your own after. On the CD, you will also receive a Professional Business Letter Writing Guide with instruction, and many sample letters for every business situation. You can also purchase a hard copy collection of successful sales letters, letters of introduction, and other marketing material that have proven successful at getting me work year after year. (and continue to do so) This collection, compiled since 1989, also comes on a CD in Word Format allowing you to personalize and modify to suit your purposes. In an effort to save you money, I’ve recently compiled all of the Training Manual content described above, along with bonus reports, successful sales letters, quotes, invoices, and more in PDF files for immediate delivery via email. You will receive exactly word for word what is contained in the hard copy material for $354.00 less. This significantly reduces your risk and gives you an opportunity to grow a very profitable business for the least amount. My goal is to enable your success at the lowest cost possible. Many of these commercial cleaning business opportunities and franchises involve the upfront purchase of equipment, product, and/or ongoing items and associated costs as part of your contract with them. Many also take a percentage of your earnings and other fees as well. I will provide you with a list of the exact equipment I use. You may have some of it in your garage. The rest you can find at your local Walmart or hardware store. In any event, equipment cost is minimal, and everything needed can fit in a car. I’m presenting an opportunity for you to serve your local business community as I do in mine at a very low startup cost. You will be cost effectively addressing highly neglected areas of overhead maintenance that are beyond the scope of janitorial, and other commercial cleaning businesses in your area. As a respected technician in your business community, you’ll enjoy outstanding rewards for saving your clients money, and solving their problems with NO disruption to their business. This is a very low cost, no competition, specialty commercial cleaning business that offers overhead dust removal, kitchen ceiling cleaning, diffuser cleaning and refinishing, overhead maintenance, grid cleaning / refinishing, waterstain removal, repair of ceiling nicks / scuffs, tile adjusting, ceramic / vinyl wall cleaning, and other valuable specialty services that will earn you an outstanding income working only part time hours. These services are a proprietary improvement over the services offered in the traditional ceiling cleaning industry. One person can operate this business and perform all the work. The Training manuals will teach you how to get the jobs, including how to size up the space and price jobs in all settings, how to perform the work, how to get repeat business and referrals, how to get others to promote your business and much more. Purchase the Hard Cover Training Manuals alone for minimal start up cost. Simply read them over, follow the instructions, and make an honest effort to apply what you learn for a month. If you haven’t been able to find enough work to cover your Training Manual cost, I’ll promptly refund it upon return of the hard copy manuals in like new condition. No questions asked. Many franchisors are pitching for your dollars out there and they know how to sell you on their ideas. I was once in your shoes. Proven and profitable, low cost business opportunities do exist outside of the franchise network. With the business I am offering, all the money you make is yours to keep, and you have complete control of your business. For a small fraction of what the franchisors are asking … for a one time fee with nothing further to purchase, I can teach you how to make more net income in your spare time than many franchises costing up to $200,000.00. If you are considering a ceiling cleaning franchise I can tell you exactly what they are offering, how it works, and what to expect. I know because as mentioned above, I did it their way for 10 years, and it was a $50,000 lesson on how NOT to do things! As for your consideration to purchase a commercial cleaning business or any other franchise, keep in mind that you’ll likely be forced to buy their equipment and / or product package. You’ll definitely be forced to play by their rules, and perhaps hand over a percentage of your revenue each month, and pay other fees. Often, the more you make the more they take. Many franchisors are now promoting no fees or monthly revenue to be paid. Instead, they are making the startup and ongoing cost larger. You may have monthly or annual quotas to reach. Fortunately for me, (and you) I learned alot from my franchise experience and found a better way to serve the same business customers and make an outstanding income in less time, with less effort, and achieve a MUCH higher level of customer satisfaction. This is NOT a janitorial business and the services provided are beyond their scope. As mentioned above, you will have to leave your home, and get your hands dirty on occasion. If that works for you the payback will be at the rate of $180 – $300 per hour. In some instances, more. I am still performing this service in my local business community, albeit on a much smaller scale. When I do work, it is at the rate of about $250 hourly on average. You need not let a fear of heights stop you from making good money in this business. 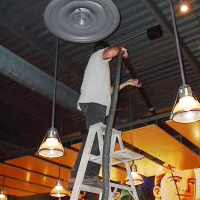 90% of the work I do on ceilings or overhead space up to 15 – 16′ in height can be done from the floor without ladders. Most commonly I use a 5′ step ladder in the instance where I need to get up to diffuser (vent) level to handwipe a diffuser clean. Even this can be done from the floor with an extension pole, fixi clamp, and sponge. (all equipment you will need) On rare occasion, I do higher up dust removal jobs off a 12′ ladder and have on even fewer occasions worked off scaffolding or scissor lifts in industrial settings. The choice is yours whether you want to do work in manufacturing plants or industrial type settings. If you choose to do this, the money earned can best be described as outstanding! I offer you an easy alternative at a fraction of the price. You will be serving your local business community by preserving and beautifying their facility, and improving their image, and saving them downtime and significant cost over other options. And ceiling surfaces are just the tip of the iceberg! 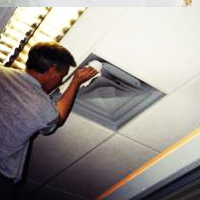 You will be generating significant revenues servicing all areas overhead in a unique ceiling cleaning business. Specialty cleaning in areas such as light fixtures, sprinkler fittings, anything that hangs, piping, ductwork, bulkheads, security cameras, TV’s, signage, promotional statues and ornaments, shelving, and so much more. These areas, are subjected to years of dirt, dust, and grime and a fortune worth of business is open for those willing to remove it. Manufacturing and industrial type settings have years of dust, dirt, and grime settled on overhead piping, equipment, and machinery. As mentioned, work in this type of environment is extremely profitable. My customers, and those who decide to join me in this business are my most valuable assets. My mission has always been to provide cost effective, safe & simple solutions to difficult problems in the least disruptive fashion, with the customer’s business foremost in mind. For those of you considering this business, the only thing I ask is that you adopt similar standards and continue to build on this, and protect the interests of your own customers and others in our network. Over the years I have developed many different sources of income generation in commercial settings. You benefit from this, and hit the ground running in your new business. All of this information, complete with my tips, tricks, and techniques will be shared with those of you willing to take the step in joining me in this very profitable, and valuable service business. This is a different approach. Less work, less effort, less risk, better results, higher customer satisfaction, more referrals, more repeat business, higher profit margin! I’ll also teach you everything you need to know about add on services to increase your revenue on every jobsite. Many of these services are accomplished using proprietary techniques that you won’t learn elsewhere. I won’t make these companies happy with my revelations, but I speak honestly and from years of experience. Anyone cleaning ceilings this way knows of what I speak. 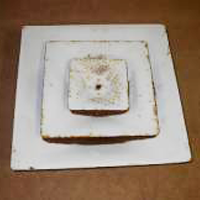 Their method involves pressurized spraying of atomized chemical solutions on ceiling and other overhead surfaces. 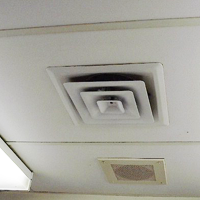 90% of commercial ceiling surfaces are paper based, acoustic tiles. Some will tell you that the spray blasts the dirt away. Others will tell you that the solution attacks the dirt at the molecular level, breaks it up, then rearranges the molecules to dissipate into the atmosphere. Some will tell you that emulsifiers, oxidizers, and enzymes break down the dirt down to a 2 micron size through a combined emulsification and evaporation process. 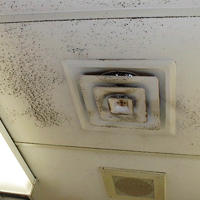 The result is a chemical change that loosens the dirt and causes it to fall off the ceiling. I could go on. There are many more explanations floating around out there. These claims are flimsy and false, and meant to impress / confuse the prospect. It’s misleading information. Frankly, its a waste of time. The prospect doesn’t really care about the how part anyways. He really just wants to know that you can improve his overhead space and give him good value. He has dirt on his ceiling and wants it removed … period. I have been there, and these are the kinds of ridiculous sales pitches I was trained to perform and current ceiling cleaning company’s pitch. Dirt doesn’t magically disappear by applying chemicals. No amount of explanation will make it happen either. More importantly, the cleaning results fall short of the standard promise these companies train you to deliver … we will make your ceiling look like new again for a fraction of the cost. I did it that way for 10 years and I can tell you that statement is far from reality. After reading my Training Manuals you will be an expert in your field and won’t have to rely on exaggerated and misleading claims to find work. I learned long ago to under promise and over deliver. You will learn how to do just that. You want happy customers. You want repeat business. You want referrals. You want your customers to give you testimonials to your great service. You want to develop good word of mouth and grow your business quickly with the least chance to leave a bad impression. This business can give you all of the above. If you are interested, I suggest you go out and do some advance scouting in your neighborhood for potential jobsites. Look up! You will soon see that these overhead areas have long been neglected. This is your opportunity to profit. 1) How you can make $100,000.00 annually working about 12 hours a week in your spare time cleaning ‘vinyl rock’ kitchen ceilings utilizing basic equipment, and an inexpensive item found at your local hardware store. I have been doing this work for years. 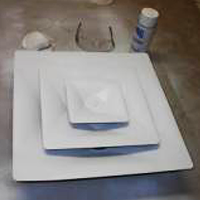 These specialty ceiling surfaces commonly found in kitchen areas and other commercial settings in the food service or restaurant industry need this service, and regularly use it. I have performed this service for every fast food chain out there … on a consistent repeat basis. I will teach you everything you need to know about getting this work and how to perform it. Every restaurant, fast food outlet, bakery, kitchen, cafeteria, donut shop, and similar settings need, want, and use this service. Be your community expert in this field. This is a very lucrative niche! *I recently discovered a technique that makes the work much easier, with much better results. I share that with you as well. 2) How to make large profits from small installations. A method of winning bids for these jobs by coming in well under competitive bids, and you don’t need to know a thing about installing a grid system. In fact, you won’t have to! I have made outstanding paychecks doing this work. 3) A plan that shows you how you can work 3 hours a day, 3 days a week for 33 weeks and earn $90,000.00. That represents an average of $300 an hour! And I have many more streams of revenue to share with you that serve the same clients. This unique ceiling cleaning business will work in your area as it has in mine. Be the first in your state to invest in a unique ceiling cleaning business that you can run from home, without employees, a work van, or special training. All the equipment you need to succeed in this business fits in a car. If you can follow my simple instructions, you can succeed in this business. Nothing has been left to chance for you. Email me and I’ll send you an information kit describing this business in greater detail. You’ll learn how it compares to the high profile franchises and other similar opportunities. This version is sent over the same day via email meaning you can get started immediately. It can be sent worldwide. It contains exactly the same information as the hard cover manuals. Both hard cover and e-book versions can be purchased at the link below. Both include a complete list of equipment needed and where to find it local to you. *International orders please email or call for details and a quote for shipping on the hard copy version.